Homework - How do you handle it? My homework policy is something that I change every year and always try to tweak. I feel like it’s such a hard balance to get students to practice, without going overboard. I want it to be beneficial, without students just blowing it off. In the past, I’ve done homework as a completion grade only. All homework assignments were worth the same amount of points (regardless of the length of the assignment). I gave points based on a sliding scale if it was turned in late or not complete. That worked fine, but I always seemed to have students just filling in random answers. While doing that only hurts themselves, it bothered me that they thought they could get credit without doing any work. So, I started having students check their homework at the beginning of class and write the correct answers for any problems they missed. The idea was that they could then go back and work the problem again to get the correct answer. Who knows if they actually did it. One thing that I’ve found that helps students take homework assignments seriously is putting questions from the homework on tests and quizzes. Students always kick themselves when they miss a problem on a test that was on the homework. I also feel like this gives students that work hard, but get nervous for tests a chance to relax. For hard workers, it can help them relax to see a familiar problem. I also gave pop quizzes consisting of only homework questions and would let them use their homework on the quiz. While that wasn’t great, it worked once or twice per school year. In my perfect world, I would just tell my students to “work enough problems so that you understand the material”, but that’s a joke in high school. I think for homework to work well, students must be intrinsically motivated. It is so hard to get apathetic students to care and see the importance of homework. 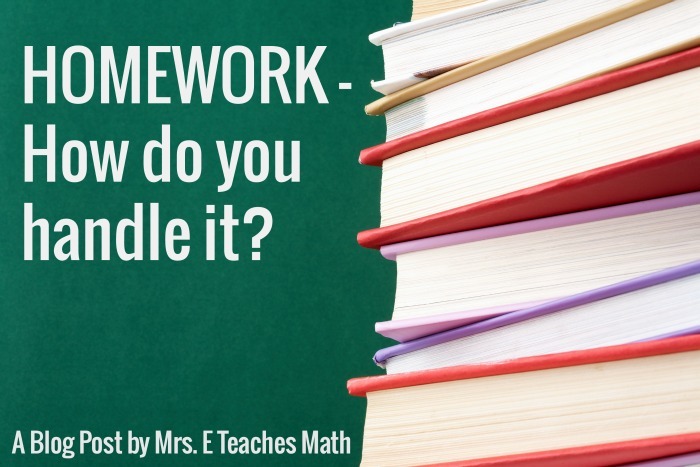 How do you handle homework in your classroom? I teach Special Ed so my students are super anxious about tests and this year seems to be way worse than it had already been. To get my students to take good notes, keep their notebooks neat and do homework, all of our quizzes are open notebook. This motivates them to take their work seriously because they know they'll be able to use it on a quiz. I have always graded for completion only. I give full, half, or no credit. Homework is half credit if turned in one day late and not accepted after that. In Accelerated Algebra 1, I hold students accountable by giving binder quizzes twice per term. On the assessment, students are asked for answers to homework problems and Problem of the Days. These students are already super motivated, but it does help provide some accountability. In eighth grade standard math, I check homework the same way. To help with motivation, I use a competition (pinning class versus class). For every day that students all have their homework, they color in a "notch." Students do a good job of holding each other accountable. I definitely saw improvement after I implemented this. They compete to win prizes like a homework pass, 20-minutes of game time, or bonus points, etc. ScaffoldedMath, I've thought about doing that in the past. I think that can be a really strong motivator for students that work hard, but don't always perform well on tests. Amanda, the class competition sounds like a great idea! Positive peer pressure can work wonders. Homework is one of the topics I think about most (I'm in my 4th year of teaching) - I still haven't figured out a great way to do it. At first, I collected every kid's work, which worked when I had a total of 60 students in a small rural school, but does not work now that I'm in a bigger town with way more kids. This year, I've started just walking around and checking for completion as students work on the warm-up. I assign 0-5 points, and don't go below 3 as long as they actually attempted it. The main thing I struggle with is deciding how much time to spend talking about homework. It seems like when we decide to discuss it, it ends up taking 20 minutes - WAY too much class time. But when we don't discuss it, the homework seems kind of pointless? I don't know - hopefully I can continue to tweak over the years until I find something that works! Michelle, I totally understand about deciding what to do about it the next day. I used to have exactly the same problem. I started displaying the worked out solutions for the students, so they could see the correct answers. However, I didn't love it. I don't know that there is a perfect way. I'm in my 5th year of teaching Geometry and Informal Geometry and I've been grading homework pretty much the same the whole time. Typical math class, I think, I teach lessons, assign homework, give a quiz part way through chapter, teach more lesson with more assignments and a test at the end of the chapter. My homework assignments are either from the textbook or are worksheets I created. As far as grading homework, I have no particular rule. Sometimes I grade the book assignments all they way through, sometimes they are just completion grades, and sometimes I collect them but don't grade them. Most of the time I will grade the worksheets all the way through, but they can be completion, too. If completion grades, those are worth 5 points. When I grade assignments all the way through, the points can vary from 10-40 points. At the end of a quarter the students' grades should be 30% homework and 70% quiz/test. I feel that if it's random, then the students have to be more on top of their homework since they don't know if I'm grading it or not. I do have a late work policy, students can turn in late work up to the day of the chapter test for half credit. This way of grading has been successful for the most part for me and my classes of students. However, I may need to come up with a new way, because our school may not be using math textbooks next year. Any ideas on how to get students to "practice" the new concepts without assigning homework? Worksheets are great, but they are very time consuming to create - especially for an entire school year. I have not done this in a long time but at one time I had a spinner with 4 sections. The four sections were 'grade for correct answers', 'grade for completion', 'do not grade', and 'homework quiz'. I would spin and whatever it said, that's what we did. Homework was a 10 point grade so grade for completion meant just that, 10/10 if it was complete. If it landed on grade for correct answers I would take it up, pick 5 random problems and grade those, 2 pts each for the total of 10. Homework quiz would be 5 problems, 4 directly from their homework and 1 new problem. The problem with the quiz option is I either had to have a quiz already made or be able to quickly put some problems on the board. The other problem with this method is I teach 6 classes so each class could do something different and I had to remember what each class got. However I am thinking I will bring this method back because I did have better homework participation when I used this. Jennifer, that is a cool idea! That really would keep students on their toes!